Texas Governor Greg Abbott—who is up for re-election in November—has done so much to bring us closer to sensible gun control since the mass shooting at Santa Fe High School near Houston last Friday, in which a 17-year-old armed with a pistol and a shotgun killed 10 people. Abbott asked Texans to join him for a moment of silence. He has asked that flags be lowered at half-mast. He has also decided that it’s best not to give away a shotgun via a contest on his website that’s open to anyone with a first and last name and email address. Champion! The webpage for the contest has been changed from one featuring the governor holding a shotgun to one without any pictures, now advertising the gift card. The change was made over the weekend, the Abbott spokesman said. Abbott’s reelection campaign launched the shotgun giveaway contest on May 1, prior to the high school murders in Santa Fe, Texas. The contest quickly caught the eyes of Texas gun control activists, who pressed Abbott over the weekend. The webpage to sign up for Abbott’s giveaway could once found at www.gregabbott.com/shotgun. That URL now redirects to www.gregabbott.com/contest. Awe-inspiring. Abbott is really coming down hard on gun control—by preventing the distribution of this one shotgun. 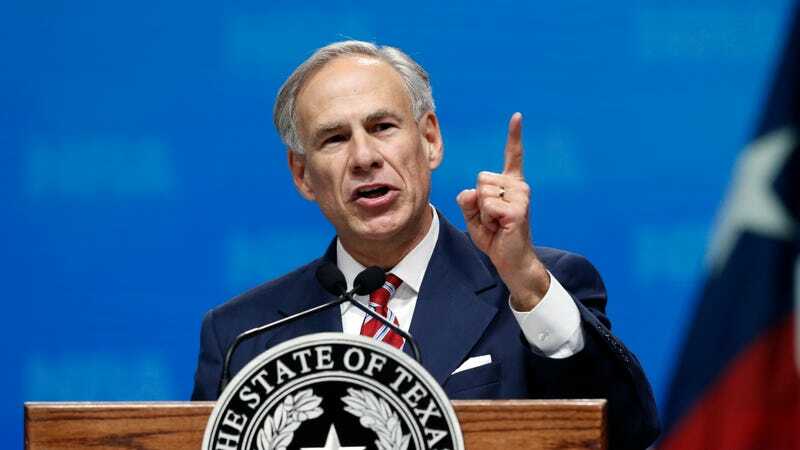 All eyes are on his fellow governors now: Will they be as brave as Greg Abbott?